Peach Cream Cheese Muffins with Streusel are wonderfully tender and with an abundance of soft peach chunks. They are topped with smooth layer of cream cheese and finished off with a sprinkling of buttery streusel. Here's a question for you: what item must you have with you when traveling? Why am I asking? Well, I'll be flying out to visit family soon, and I'm mentally making my checklist. One item that goes everywhere I go is hand sanitizer, but on extended trips, sanitizing wipes are also added to the list. Do you know what the dirtiest surface on a plane is? I've read that it's the trays! Yikes!! Apparently some people use it for personal grooming. I have also heard that some use it to help with diapering their little ones! I don't know if that means putting the babies on top of the tray or their soiled diapers. Regardless, ewww! and ewww!! With that thought etched in my mind, this germaphobe always gives her seat and tray a good wipe down. I won't be staying in hotels on this trip, but if I were, you can bet that I would come equipped with plenty of sanitizing wipes to give the room a thorough wipe down too! My husband lovingly calls me a freak, but after being with me all these years, some of my habits have rubbed off on him. He is very diligent at rubbing down shopping carts (patting myself on the back right now). I had a craving for something peachy, and even though it is not peach season, I saw it as a perfect opportunity for a peach post. 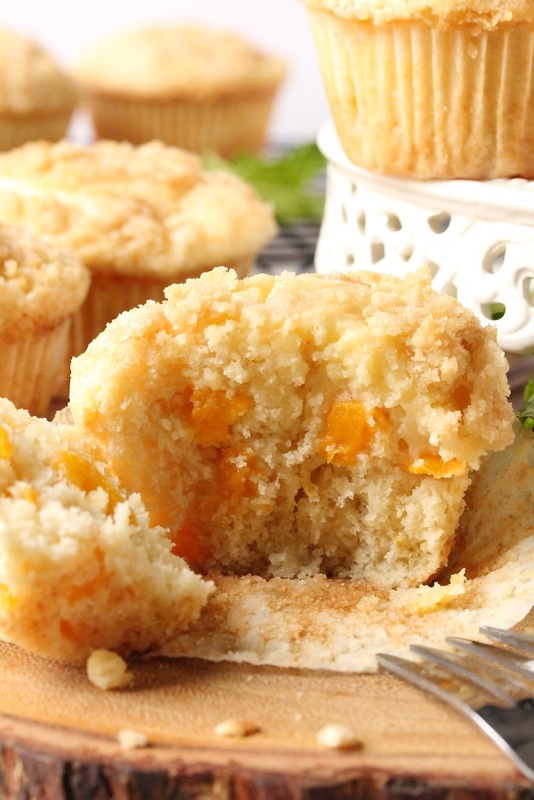 Because canned peaches are used, these muffins are perfect for anytime of the year. No need to wait for the fruit to be in season! I've been making a lot of blueberry desserts to use up blueberries I had frozen last summer. With some slight alterations to my blueberry muffin recipe, these peach muffins were born. 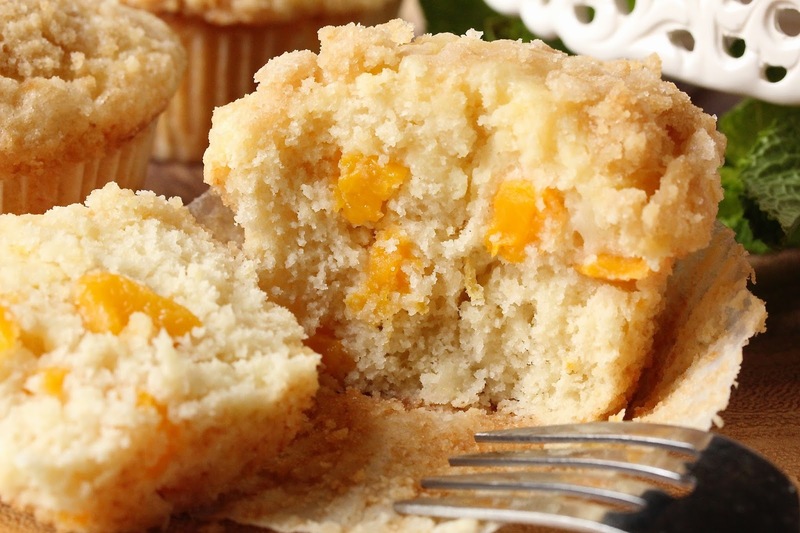 These muffins are tender (but what I really want to say is moist) and loaded with peach chunks. With a slight tang from the cream cheese and sweet and buttery streusel, it will leave you wanting to do a happy dance. I did! I'll be making this again and again! I chose to flavor these muffins simply with vanilla extract, but you can kick it up with some cinnamon added to the muffin and/or streusel. And how about adding chopped pecans to the streusel? That would be awesome too! Preheat oven to 350° F. Place paper liners in a 12 cavity muffin pan. Drain peaches in a colander. Dice peaches into small 1/4"-1/3" chunks. Return to the colander. Use a large spatula to gently press out the juices of the peaches. Set aside to drain. In a small bowl, blend flour, corn starch, baking powder, and salt. Set aside. In a large mixing bowl, beat sugar, egg, milk, oil, and vanilla extract until smooth, about 1 minute. Remove 2 tablespoons of the flour mixture and set aside. Gradually add the remaining flour mixture to the wet, stirring until just blended. Do not over mix. Use several paper towels to blot the peaches completely dry. Place in a bowl and add the 2 tablespoon of the reserved flour mixture. Mix to blend. Add the peach to the batter, stirring until incorporated into the batter. In a separate bowl, combine all of the streusel ingredients. Using a pastry blender or your hands work the butter into the mixture until the butter is pea sized. Fill each muffin cup 3/4 full with batter. Using a large spoon, place the cream cheese over the batter using a digging and twisting motion in the center to work some of the cream cheese into the batter. 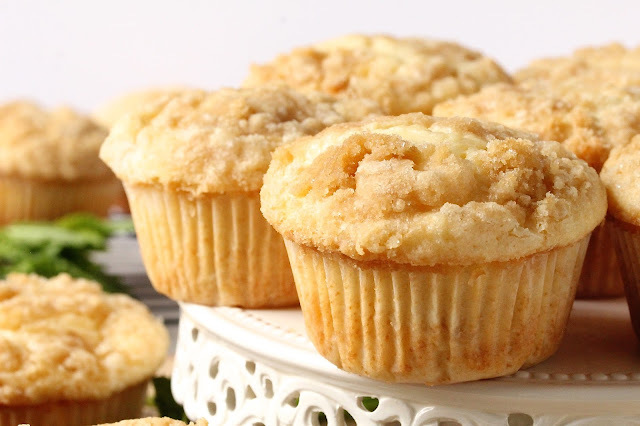 Top each muffin with a generous spoonful of streusel. Bake for 22-26 minutes or until a toothpick come out with some crumbs attached. Allow to cool for 15 minutes prior to removing the muffin from the muffin pan. Allow to cool completely. Store in an airtight container, refrigerated. I have read the same thing about airplane trays - SO gross!!! I'm also a weirdo about wiping them down, so you're not alone. My must haves for traveling are lip chap, hand sanitizer and moisturizer! 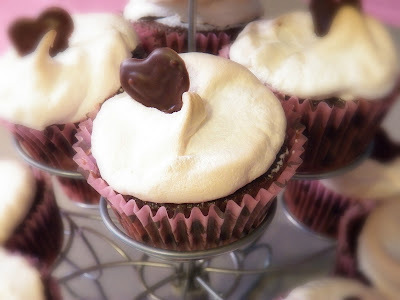 These muffins are so dreamy, Thao. I love the streusel - all muffins should have streusel!! Lip balm! Yes! I go everywhere with them too...year round! Oh! And hand cream, another must have. I'm so glad we have similar check lists! Glad you didn't wait until peach season for these beauties because I need to make them for Sunday brunch this weekend! I'd also cut one of them in half, toast them up, and put ice cream on them for dessert. I don't really have an essential travel item but, after reading your post, I'll now carry wipes around with me EVERYWHERE!!! lol! OMG! I need to steal your dessert idea! It sounds awesome! Here's a tip from a seasoned pro: I leave a container of hand sanitizer in the car so I can be ready at all times, and I also carry a few in zip lock bag in my purse. Too much? I understand if you're not ready for that yet 😆! Have a great brunch, Karrie! This will prob sound crazy, but i've prob only used sanitizing wipes a couple times in my life. For me, I must have water when I travel. I hate to feel dehydrated. Anyways, these peach muffins look awesome. That struesel topping looks delish! When my kids are little and when did daycare, wipes became a big part of my life. Now I'm just neurotic about it 😆. Water is great too! It's definitely ranks high on my must have list. I have heard about airplane trays... so icky. I need to start carrying around wipes. The thing that I can't leave my house without is my phone. When I'm travelling, I need a good data plan too to use GPS and research places to go. Anyway, these muffins looks so wonderfully fluffy and full of peach flavour! Plus that streusel on top is perfect. I guess I’m not a light packer. A phone is a must for me as well, especially when I’m alone. I’m directionally challenged and and aveca had time finding myself around.:). GPS is a must! High five got my hand sanitizer buddy!! �� Facial cleanser and moisturizer are also essentials for me too on overnight trips to help keep my skin looking like I’m stil in my 20’s (hahaha)!! I have never come across a peach muffin until I decided to make these, and I’m glad I did! They are a keeper! Wow these muffins look stunning! I love the streusel topping! I did the same with blueberries muffins it was so tasty I loved them. I bet the combination of peaches and cream cheese made these muffins so moist and sweet! 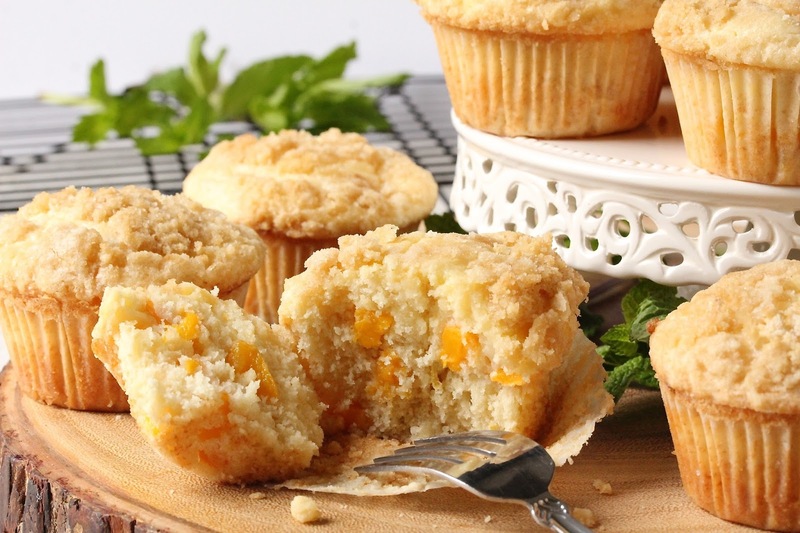 These muffins with peaches look amazing!! Anytime I hear cream cheese I know they're gonna be great! lol I can see why you carry sanitizer, those planes really aren't as clean as they should be and I hate a sticky tray. Take care. Hahaha! The same goes with me when I hear coconut. It always gets me attention. Once I'm through wiping down, there are no such things as sticky trays, seat belts, armrests, air nozzles, or light switches :) Take care Stacey. I didn't know how dirty those trays are. Just one more reason I always get sick after plane rides...These muffins sound AMAZING, Thao! They are beautiful ! bravo.